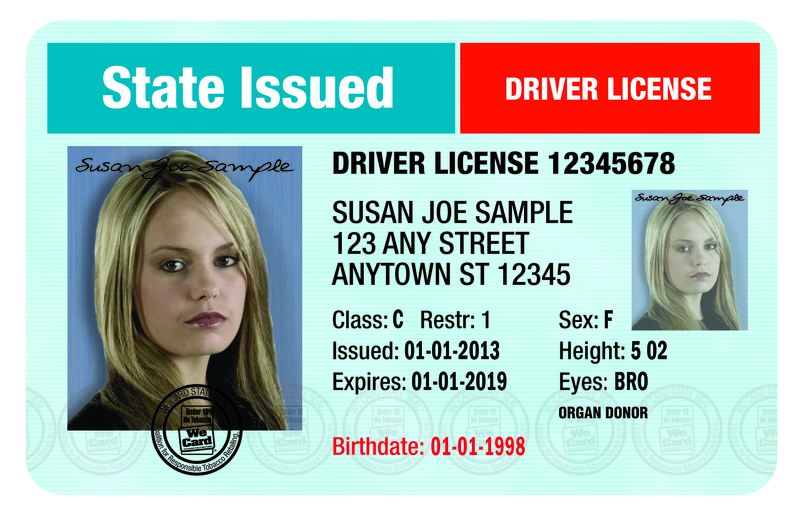 BE AWARE:Some states have specific "underage" driver's licenses that may have unique characteristics such as big red letters indicating "underage" or the licenses may be vertical. Make sure you know if your state has a specific underage driver's license. Date of birth: Compare it to your We Card Age-of-Purchase Calendar to ensure the customer is of legal age. Photo: Compare the customer to the picture. Is this person the same? Description: Does the description on the ID match the customer? Expiration Date: All forms of identification used to verify age MUST be valid. Don't accept an expired ID! Look at the ID under a bright light to detect flaws and alterations. The ID card depicted is a facsimile of a state ID card containing typical information. This illustration is not intended to replicate any state ID card, nor should it be used as an ID card. If the ID has two photos, make sure they match. Make sure the state seal, logo or hologram have not been altered. Check the lamination (if any) for peeling, scratches or bubbles. If "Duplicate" appears on the ID, be cautious. Someone else may be using the original. I've spotted a fake ID, Now what?